In a bid to correct our low standing in global automation rankings, the Australian Centre for Robotic Vision has initiated the nation’s first Robotic and Computer Vision Roadmap. Australia currently sits in 30th place globally for automation by the International Federation for Robotics, a ranking that the Australian Centre for Robotic Vision’s Chief Operating Officer Dr Sue Keay attributes to low uptake of automated technology by Australian companies. Even though there are some areas where Australia is arguably a world leader, such as mining, she said that Australian companies might not be taking up this technology due to obstacles in their path. “We’ve got the technology and the smarts, but we are not seeing the implementation,” she said. Keay views the roadmap as a guide for the engineering community on where they should concentrate resources and energy to maximise the nation’s capabilities in the robotics and computer vision fields, as well as encouraging future engineers to specialise in these areas. 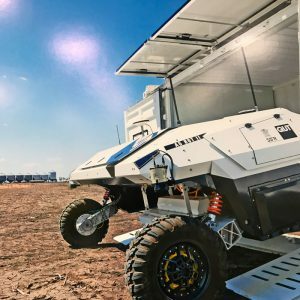 An agricultural robot designed to use computer vision techniques to identify and eradicate weeds in broadacre horticulture returns to its solar-powered charging station. Another key driver for the roadmap is informing government policies to encourage robotics development, and make sure the benefits of their application accrues in Australia. “We are developing a number of smart people with expertise in this area. The risk Australia has is that all of these technologies will end up in the hands of global companies like Google, Amazon and Facebook, and we will not share the fruits of this expertise,” she said. The roadmap will also help academics apply computer vision and robotics technologies to the nation’s most important problems, without being distracted by other, less critical issues. “There are any number of problems that we can apply these technologies to, but are these the problems we really need solved?” Keay said. The structure of the roadmap will be based around these sectors and influenced by their respective needs and challenges. “We might find that there are some commonalities, but in general we would hope to be able to illustrate in each sector what the economic drivers and benefits of these technologies are,” Keay explained. The centre is working with several other organisations, including the Australian Society of Robotics and Automation, the Institute of Instrumentation Control and Automation and the Australian Academy of Sciences, to make sure the roadmap’s recommendations have wide support. “We want to be as inclusive as possible, not reinvent the wheel,” said Keay. With that in mind, the centre is calling on the engineering community, government, industry and academia to provide input and help shape the Robotic and Computer Vision Roadmap. Through this process, Keay hopes to identify Australia’s opportunities to make its mark on robotics and computer vision technologies, remove the barriers standing in the way of more widespread adoption of robotic technologies and give industry the confidence to rely on Australian innovations. The centre has already hosted a series of workshops in Canberra and Brisbane in October, with additional workshops to be held in Melbourne, Sydney and Adelaide in November. They also invite open submissions to the roadmap from all interested parties. Each of the workshops held in preparation for the roadmap focuses on one of the economic sectors. A workshop on transport logistics and services on 17 November will be co-chaired by Dr Michael Lucas, who is also the Deputy Chair of Engineers Australia’s National Committee on Mechatronics. Workshop participants are invited based on written submissions, however Keay stressed that anyone wanting to be involved should contact the centre. Drafts of the roadmap will be circulated to workshop participants, and a more general opportunity for public consultation on the draft plan is scheduled for February next year. Learn more about the Robotic and Computer Vision roadmap here.